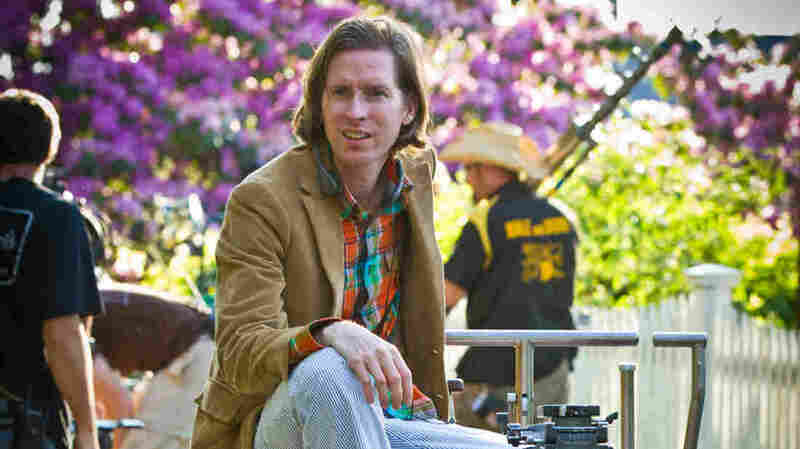 Wes Anderson, Creating A Singular 'Kingdom' The filmmaker's latest project, Moonrise Kingdom, recently opened the Cannes Film Festival. It's the story of a 12-year-old girl and boy who fall in love and then make a pact to run off into the woods together. Wes Anderson's Moonrise Kingdom opened the 2012 Cannes Film Festival. He received Academy Award nominations for The Royal Tenenbaums and Fantastic Mr. Fox. Director Wes Anderson has many credits to his name — The Royal Tenenbaums, The Darjeeling Limited, Bottle Rocket and Fantastic Mr. Fox among them — but Moonrise Kingdom is his first film to open the prestigious Cannes Film Festival. Starring Bill Murray, Tilda Swinton, Bruce Willis and Edward Norton, the quirky independent picture tells the story of a 12-year-old girl and boy who fall in love and then make a pact to run off into the woods together. Anderson tells Fresh Air's Terry Gross that the movie, set on a remote (and fictional) island off the coast of New England, is what he calls "a memory of a fantasy." "I remember the emotion of feeling like I was falling in love at that age, and how powerful it was and sudden and inexplicable," he says. "And nothing happened in my case, but I think it's a fantasy I would have had at that age — would have envisioned. ... These two characters are hit by a thunderbolt and determined to act on it." 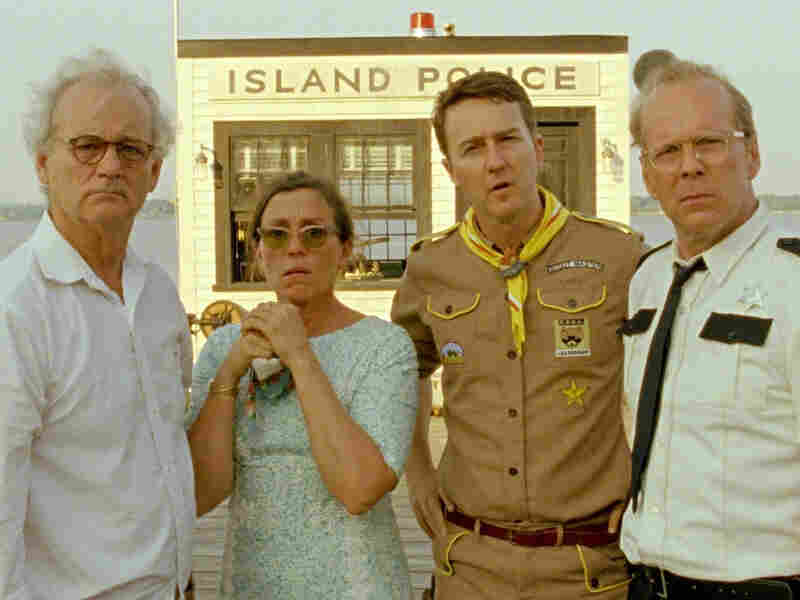 Bill Murray, Frances McDormand, Edward Norton and Bruce Willis star in the film — the story of a 12-year-old girl and boy who merge their imaginative worlds on an island off the coast of New England. Kara Hayward and Jared Gilman, who play the preteens Suzy and Sam, were cast after an extensive search, says Anderson. "My experience with casting children is that ... the whole movie is going to rest on their shoulders, so you have to set aside time and wait for the perfect people to appear," he says. "After we saw [Kara and Jared], we shut down the search, and they're the ones who are in the movie. And they define the characters more than the script does, I think." In the script, Sam and Suzy are separated by distance — Suzy is at home in her beach house, and Sam is away at scout camp — so they must traverse the woods to eventually find each other. Anderson himself was a scout for a short time as a child. He drew on those experiences while crafting the plot of Moonrise Kingdom, which stars Willis as a sheriff, Frances McDormand and Murray as absent-minded parents, and Norton as a hapless scoutmaster in charge of finding his missing camper. "Edward Norton was someone who I corresponded with over the years, and he was somebody who I thought of as a scoutmaster," says Anderson. "He looks like he has been painted by Norman Rockwell." Anderson says he drew on Rockwell, as well as his other films, while designing how Moonrise Kingdom would look. "I have a way of filming things and staging them and designing sets," he says. "There were times when I thought I should change my approach, but in fact, this is what I like to do. It's sort of like my handwriting as a movie director. And somewhere along the way, I think I've made the decision: I'm going to write in my own handwriting. That's just sort of my way." "I have always wanted to work in the theater. I've always felt the glamour of being backstage and that excitement, but I've never actually done it — not since I was in 5th grade, really. But I've had many plays in my films. I feel like maybe theater is a part of my movie work." "We took details from all of these [houses] that we had visited, and then we made the place in a Linens 'N' Things outside of Newport, R.I. There's not much that takes place in the house, but there are key scenes in the beginning, and it was all constructed to the shots." "I usually just want them to be as authentic and natural as possible, but I'm oftentimes giving them a scene that is nothing like they would have said it. Usually what's written is a bit odd. It's not my intention that it be odd. But what interests me as a writer is a sentence that's got a surprise in the way it's put together. And so usually I think they're doing something that doesn't feel perfectly natural to them, and then it's combined with the visuals and the movements that I'm drawn to. ... When I see the first dailies on any movie, I usually feel that I had no idea how this combination of ingredients was going to mix together, what it was going to produce." "We had this policeman who is lonely and insecure, and yet, when I was thinking about who could play this, I wanted somebody where, as you got to know his personality and see what a sad character he was, you would get that thing that you sort of get with real police. You can tell when somebody's a cop. There is something that's often projected from an actual policeman, and Bruce Willis has this cop authority, where even if he's playing something away from what he normally plays, you would never question whether Bruce Willis is the police."